Sometimes, its quite surprising how easy it is to find a glimpse of traditional rural life close to Bangkok. The island of Ko Kred lies just a few miles north of Bangkok proper; so close that many would consider it within the city itself. The island is actually man-made. It's the result of the construction almost 300 years ago of a channel cut through a sharp bend in the Chao Phraya River to shorten the trip up and down river from the then-capital Ayuthaya. The island has made a name for itself by producing earthenware pots in a variety of styles. You'll find a number of kilns and shops around the island. They are, in fact, the island's main tourist attraction. You'll find most of the shops on the northeast corner of the island, which just happens to be where the ferry from the river bank docks. Once you get past the main built-up area you quickly enter into a very rural scene of village life. The same clay which results in the island's famous pottery is also rich soil for growing a variety of fruits, so as you wander around the island you will pass orchards and other farms. There are a number of temples around the island. In addition to Wat Poramai, another interesting one is near the northeast corner of the island features a very large tree as well as a large number of chedis in various states of decay. The large tree is something of a shrine, and at its base a makeshift altar displays a large collection of children's toys. If you walk all the way around the island in a counter-clockwise direction, then when you come back to the channel and head north, you'll find yourself walking along a path containing many restaurants on the river-front. Many have English language menus, so if you're a bit hungry these small shops make a very nice place to cool off and watch the boats go by. Most western tourists get to the island by boat. 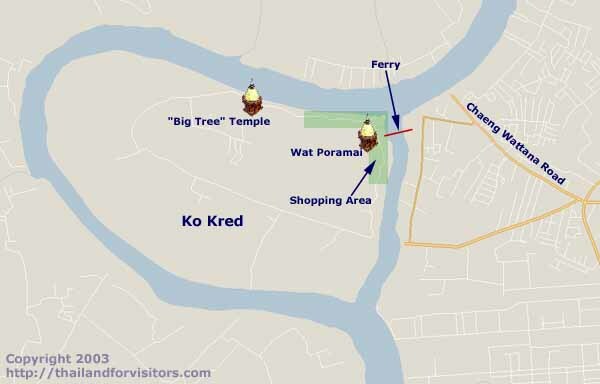 A number of river tour operators have day trips to Ko Kred. Some overnight trips move on to Ayuthaya. You can also take the Chaophraya River Express Boat service to Nonthaburi pier, where you can get a connecting boat to Ko Kred for about 100 Baht. You can also rent a long-tailed boat to take you there from any of the public piers in the city. You can also get to the island by road to Pakkred town. Ferries cross the channel from Wat Sanam Nua to Wat Poramai every few minutes and costs just 2 Baht (US $ 0.05). We have seen many Bangkok taxis in the area, so it may be possible to find a driver to take you to the ferry pier. The trouble may be finding one to take you home!